The Ellie Brady Memorial Set Dance night with the Brian Boru Ceili Band will take place on Friday 29th August and starts at 9.30 until 12.30 in aid of Cancer Research. Supper served and bar extension available – what more would anyone need on Friday, 29th August before the kids all head back to school. All are welcome. Learn traditional Irish music and dance with an award-winning Comhaltas branch (guitar, fiddle, flute, tin whistle and grupa ceoil). Classes are held at 7 pm on Tuesday nights in St. Laurence O’Toole N.S., Roundwood – first term is from September to January, second term is from January to May. Performances, sessions, workshops and outings take place throughout the year. For more information contact us via e-mail at roundwoodcce@gmail.com or phone 087-2841604. A reminder that the Active Retirement Lunch club will take place on Friday 19th September in Woods and Byrne, Roundwood at 1.30pm. Bridge returns to Roundwood Community centre with the Diamond Bridge Club commencing on Monday 8th September at 7.45, no partner required. Anyone interested in Bridge Beginners Lessons please contact Triona on 0877630968. 002 Bridge Club commences on Friday 12th September at 9.45 again no partner required. Please note Sandra Dunne a former member of the 002 Club is running a Charity Bridge night in East Glendalough School on Tuesday 2nd September starting at 7.30 no partner required entry £10 with all monies raised going to the Niall Melon Trust. Looking forward to catching up with all after the long hot summer Triona and Gaye. Calary Church, which celebrates the 180th anniversary of its consecration this year will be open between 2pm and 6pm on Saturday 30th and Sunday 31st August. There will be free guided tours of the church, which includes the pulpit used by Rev John Nelson Darby, one of the founders of the Plymouth Brethren. There will also be an exhibition of local photographs, some taken with pinhole cameras and country produce will also be on sale. At 7pm on Sunday 24th, there will be a Songs of Praise, to which everyone is invited. Results from Captain’s Prize held in Rathsallagh on Saturday August 23rd. Winner C Staunton 42pts, Second D Menzies 42pts. Class 1: P Turner 36pts, C O’Brien 33pts, C Gaskin 33pts. Class 2: L Brady 36pts, W Kenna 36pts, J Staunton 34pts. Class 3 : R Mcilhenny 33pts, E Dowling 33pts, J Nash 32pts. Past Captain’s Prize W Byrne 33pts. Nines D Mockler 21pts, J Dowling 21pts. Nearest Pin: T McHugh. Visitors : J McHugh 33pts, A Sinclair 28pts. President’s Prize was held on Saturday August 23rd. The club President for 2014 Breda Murdoch hosted the day. Congratulations to Lady Captain Deirdre Carroll (20) who won the prize with 39pts, Second on the day was Marian Molloy (28) who had 36pts. Third place went to Joe Kavanagh (12) who had 35pts. Ladies Longest Drive Valerie Brennan. Ladies Nearest Pin Grainne Griffith. Mens Longest Drive Martin Baker. Mens Nearest Pin Peter Fitzgerald. Well done to all and many thanks to Breda for a great day. There was no winner of last week’s jackpot. The numbers drawn were 14, 21, 24 7 26. There was one match three winner M Shelly. Next week’s jackpot will be €11,300. The Peter Darcy Memorial Golf Classic will be held in Roundwood Golf Club on Saturday September 13th. Format is Fourball scramble. Timesheet from 10.00 until 16.00. Some earlier times can also be accommodated. Cost is €160 per team of 4 including meal in Woods restaurant and free entry to music night in Woods (3 bands including Roamin’ Cadillacs). Guaranteed to be great fun, last year it was one of the best nights of 2013. Proceeds go to Roundwood juvenile soccer club (founded by Peter Darcy) with a donation to Roundwood Senior Citizens Christmas Party. We hope you can support this event in memory of a great friend to many. Please contact Martin Byrne at 0879170231 to book a time slot. The Wicklow Man will play in Moneystown Community Centre on Friday 12th September from 9.30pm until 12. Door prizes, teas served refreshments also available. Come along and enjoy a night of waltzing, jive, line-dancing, etc. Progressive 45 cards will be held in Aras an Tochar at 8pm on Sunday August 24th. Generous cash prizes on the night and refreshments will be served. Set dancing in Kavanagh’s lounge every Thursday night with music this month by the O’Kane family. Session from 9pm until 11. Ellie Brady memorial night is on Friday 29th August so please come along on Thursday nights to brush up on and learn the new set dances. Love if you could join us on the dance floor for a night of fun and lively banter. The results of the whist is as follows:- Top Score: Pat Fisher; First Top Gent: Lucy Molloy & Margaret Kennedy (Shared); First Lady: Ann Pierce; Second Lady: Ann Wolohan; First Half: Kitty Kennedy; Second Half: Patricia Byrne; Lowest Score: Tiny Shortt & Longest Sitting: Martin Byrne. Raffle prizes were won by Maureen Gaffney, Lucy Molloy & Ann Pierce. The next whist will be on Wednesday 3rd August in the Parish Centre. This entry was posted in News & Events on August 26, 2014 by roundwoodiewicklow. This entry was posted in News & Events on August 18, 2014 by roundwoodiewicklow. Roundwood Village is twinned with Spezet, a small town in Brittany since 1986. After their recent rip roaring festival, the highest village is again preparing for another festival of music and dance with the arrival of 34 musicians, singers and dancers from Spezet for a week on the 16th of August. 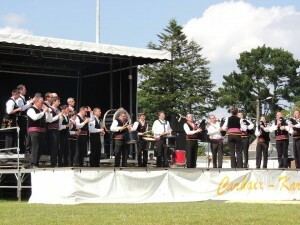 The group are members of Spezet’s traditional Breton band, Bagad Osismi Speied who will be staying with local families. 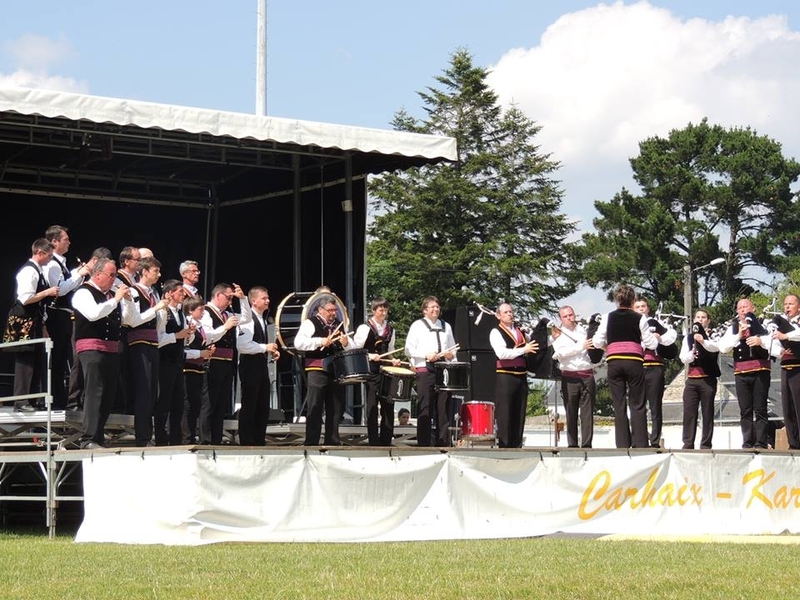 The Roundwood and District Community Council have pulled out all the stops to ensure the group have a week to remember in the Garden County as they have organised the Bagad to perform in various iconic locations during their week’s stay. The fun begins on Saturday 16th at 8pm with the official welcome night in Roundwood’s Coach House where the group will join with local band ‘Coddle’. On Sunday the Bagad heads west to perform at the very popular Hollywood Fair at 3pm. That night some of the musicians will join in with the Roundwood Sessions in Byrne and Woods, Roundwood. Monday will see the group heading to explore Bray with a radio interview on East Coast FM followed by performances at 2pm and 3:30pm on the Band Stand on Bray Promenade. Tuesday, the group will stay in the hills with a visit to the ESB Turlough Hill, then a lunch time performance in the grounds of the Glendalough Hotel followed by some well deserved time off to explore the valley. That evening the group plan to head to the Glenmalure Lodge to join in with the traditional music session there. It’s off to the big smoke on Wednesday where the group plan to do some sightseeing and a spot of busking on Grafton Street. It’s back to the coast on Thursday, but this time to Wicklow Town, to visit and perform at Wicklow’s Historic Gaol at 3pm and hopefully to catch a few waves at Brittas Bay if the weather permits! That night the dancers will take to the floor in Kavanagh’s Vartry House in Roundwood as they join with the local set dancers and musicians in the regular Thursday night set dancing session starting at 9pm. After all that action, the group will have a free day on Friday to prepare themselves for their last performance in their host village, in a grand finale BBQ evening with many local musicians at Roundwood Parish Hall kicking off at 6:30pm. 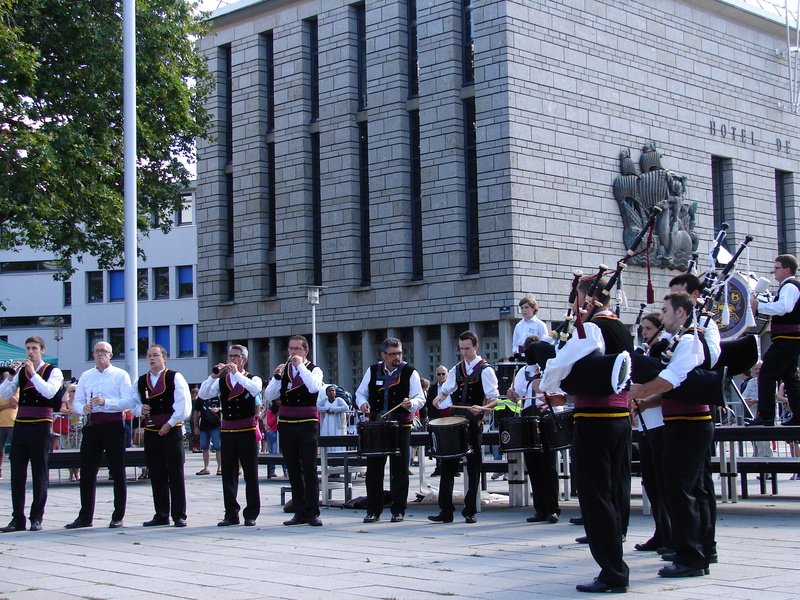 The performances by the Bagad will be up to one hour long and are guaranteed to provide a colourful display of traditional costumes as they entertain with traditional dances and Breton musical instruments. The group are eager to interact with the crowds and encourage their audiences to try the Breton instruments and join them in with the Breton dancers. The visit is set to continue to strengthen the links that Roundwood has forged with this area in Brittany and also showcases the great tourism product that Wicklow has to offer our visitors. The geographical spread of the various free events provides a great opportunity for the people of Wicklow to catch a performance by this award winning group, the Bagad Osismi Speied. The Roundwood Community Council hope the people of Roundwood and beyond will give their visitors a great welcome by coming out to support the Bagad as they perform throughout the county. This entry was posted in News & Events on August 13, 2014 by roundwoodiewicklow.